You'll always find something fun to do with Adirondack Winery! Whether we are holding a unique event at our tasting rooms or participating in a local wine festival. Follow our events page to join in on the fun! Click here for calendar view! 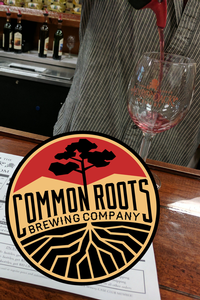 Adirondack Winery Supports Common Roots! What happened to Common Roots is every small business owners worst nightmare - this is one of the ways we want to help! Join us April 26-28 at our Lake George Tasting Room as we rally to help Common Roots rebuild! Come in for a tasting and we will donate all the tasting proceeds to our friends at the South Glens Falls Brewery, which was forced to close last week after a devastating fire. Plus, we'll be selling T-shirts all weekend, with the proceeds going towards helping Common Roots rebuild! CLICK HERE TO GO TO OUR FACEBOOK EVENT AND SHARE TO HELP THE CAUSE! Visit our Lake George Tasting Room for a special promotion and follow our social media accounts for news about a Flash Sale! We can't thank our teacher friends enough - but we are going to at least start with a special wine cocktail! 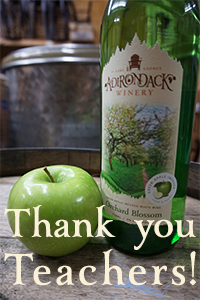 During teacher appreciation week, stop by our Lake George Tasting Room for a special wine cocktail on us! Stay tuned for details and follow our social media feeds for more information. Mom cares for you like no one else does and you can pay her back by giving her something she really wants - WINE! Bring the Mom in your life in for Mother's Day weekend and we'll make it an experience she'll never forget! All Mother's Day weekend, we'll have giveaways, free samples of a lavender-infused lemonade wine cocktail, and personalized wine bottles for sale so you can tell her exactly how you feel with a handwritten message on a bottle! Plus, we have Lavenlair Farm in Lake George on Saturday, May 11th from 12-4pm so Mom can pick up some of the best natural lavender products out there, including lavender lotion candles, lavender body butter & more! 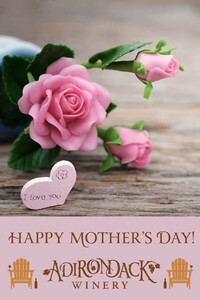 You can also play our Wine Words game to make Mom feel extra special & you can enter our raffle to benefit Kelly's Angels! Click here to see the Facebook event and tell us you're interested! Nothing says Happy Mother's Day like a good 5k run in Saratoga! 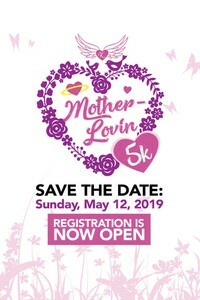 Run alongside our team in support of Kelly’s Angels. This amazing charitable organization provides grants to benefit children in the Capital Region of New York State whose lives have been forever changed by the loss of a parent or sibling to cancer or other illness. 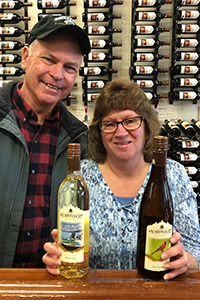 Join Adirondack Winery at the 6th Annual Wine and Food Festival that will feature beverage trail members plus other regional wineries, distilleries and cideries! There will also be wonderful farm producers sampling and selling their delicious gourmet cheeses, baked goods, jams, jellies and so much more! Throughout the weekend there will be special seminars by some of the region’s foremost experts in the craft beverage industry. Tasting Ticket: includes admission, souvenir tasting glass and all the wines, ciders and spirits you care to taste for one price. General Admission - Non-tasting Tickets- $10. 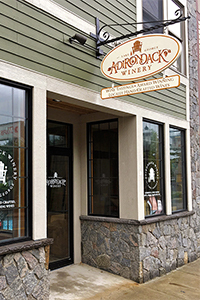 Free upgraded wine tasting sessions and free gifts for Adirondack Winery Club Members. 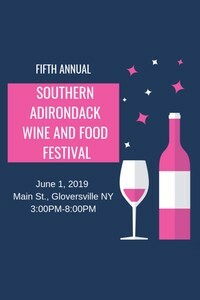 Be sure to visit Adirondack Winery at the 5th Annual Southern Adirondack Wine and Food Festival and try our delicious wines! A wine festival in the foothills of the Adirondacks featuring wineries from New York State, local restaurants, musicians, arts & crafts, and architectural tours of historic, downtown Gloversville. 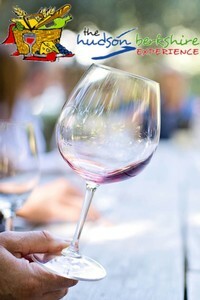 Tickets get you wine tastings and a commemorative wine glass to be used for tastings. You can buy specially prepared food from our food vendors and bottles of wine to go are available for purchase from the wineries. Bottles of wine cannot be consumed on festival grounds. Proceeds will benefit downtown Gloversville and future events. Attendees MUST be 21 years old or older as of June 12, 2016 for tastings. IDs will be checked & wristbands will be given to allow you to participate in tastings. Please note that there will be no activities for children at this event. Our Bolton Landing Tasting Room is turning two! Stay tuned for details about anniversary events & sales. Dad loves wine too! Bring him in for a memorable wine tasting session and to bring home some bottles of his favorite wine! 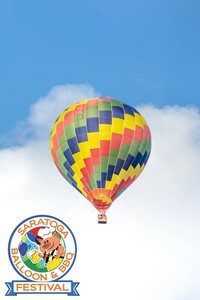 Don’t miss the 6th Annual Saratoga Balloon and BBQ Festival (formerly the Saratoga Balloon and Craft Festival) at the Saratoga County Fairgrounds in Ballston Spa. This family-friendly event celebrates the best of the capital region with food, live entertainment, shopping, kids activities, and balloons! Be sure to stop by and visit our booth to taste our delicious wines! The 5th Annual Adirondack Wine & Food Fest will be the biggest one yet! Join us & 120+ wine, craft beverage and artisan food vendors and more! Charles R. Wood Festival Commons in Lake George. 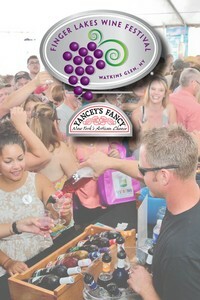 Tickets are on sale now at adkwinefest.com. Shop early for the best deals on tickets! Live locally? Sunday is a great day to beat the lines and drink wine with your fellow Adirondackers. 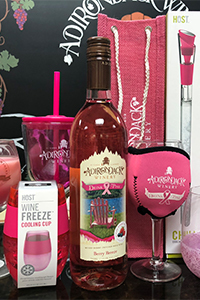 Join Adirondack Winery at the 2019 Finger Lakes Wine Festival! 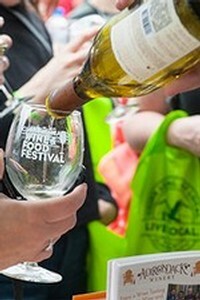 This festival offers the largest showcase of New York State wines with over 80 wineries paired with regional artisans, music and culinary classes all in one beautiful location - Watkins Glen International. Try our delicious wines and find one that you LOVE! What pairs well with wine that isn't food? Music! 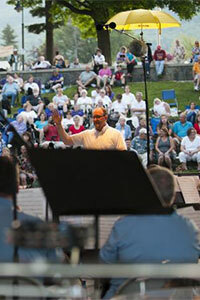 Relish in beautiful sounds at the 15th Annual Lake George Community Band Festival! The Lake George Community Band was formed in 2003 with the intent to be a marching band that would represent the Lake George community at various events throughout the year--in particular to help celebrate the centennial of the Village of Lake George. The marching band concept evolved into the formation of a concert band with a marching division. The band's first rehearsal was held in May 2003 under the direction of Mr. Greg Mason and their first public performance followed on August 14, 2003 in Shepard Park. In September 2003, the marching unit participated in the centennial celebration of the Village of Lake George. In 2005 we hosted our first Community Band Festival which was a showcase of nine bands from surrounding states and a tribute to our faithful audience. This festival was continued each year since and is being repeated this year! Our tasting room is directly across from Shephard park, so you can enjoy the music and enjoy a tasting! 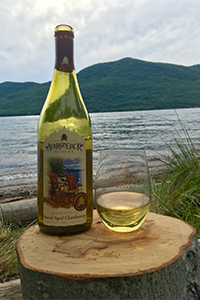 Free upgraded wine tasting sessions and free gifts for Adirondack Winery Club Members! Our Annual Fundraiser for Making Strides Against Breast Cancer! Last year, we raised $8,000 and we are trying to raise even more this year! 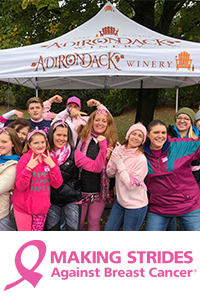 Help us achieve our goal by visiting our tasting room for special events, purchasing our Drink Pink wine and more! Our Annual Fundraiser culminates with this fun walk through Glens Falls for a great cause! Donate a toy at our tasting room for a free wine tasting session!